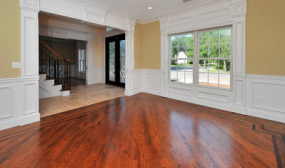 We strive to preserve the natural appearance of hardwood floors with our French-Waxing process in your home or office. Our products and techniques enhance the color and texture of your floors. In addition we can develop a cost-effective maintenance program for high traffic areas to prolong the life of your floors and reduce the need for costly stripping or sanding. We use quality materials in our re-coating process to minimize yellowing and color distortion. Our trained, experienced technicians apply a durable protective surface that requires a minimum amount of care. Our helpful office staff can tell you more about our hardwood floor cleaning and polishing services. For personalized service, please call us at 201-796-1844 between 8:15AM - 5:00PM Monday through Friday or email us at cameoservices@yahoo.com.